ASUS’ STRIX line-up went into flight in the middle of this year, focusing on gaming grade features while targeting the prosumer market. Not to be mistaken from ASUS’ ROG, the STRIX line-up is a broad series coming from ASUS, dealing with GFX cards and headsets initially, but will expand further into the gaming peripherals later on. Now what we have here is the ASUS GTX 780 STRIX OC Edition. A card that contains the soul of the latter year’s former single GPU king that has been dominating the market since last year. Initially, we do not have plans on reviewing this out, since the GTX 970 & 980s are already out in the market, but when news about Nvidia dropping out the prices of these beasts to flush out the remaining high-end GTX 700 Series in the market, it’s a welcome addition to our growing GFX card reviews, and you might encounter this certain card at a very reasonable price. The GTX 780 STRIX OC is an overclocked GFX card with a 889 MHz base clock that puts up a reasonable 941 MHz boost clock whenever permitted. With a 6GB of available VRAM operating at 1502 MHz with a 384-bit memory brandwidth, this thing is meant for 2K and multi-monitor gaming, as well as sating the appetite of gamers who wants a silent card to game on with its 0 dB feature. ASUS derived the styling of the STRIX products to an owl since silence and gaming performance is the line-up’s specialty. ASUS also made an illustration about it which is over the top me thinks. The GTX 780 STRIX is built similarly to the DirectCU II cards. It has the same direct touch heatpipe design, also has a backplate, and a rigid reinforced frame for PCB support so it wont bend easily. VRM is also reinforced with 10 Phases of power delivery. ASUS never wasted any time to redesign their packaging as they used the same ones found on their lesser line-up. I have nothing to say against this but since ASUS wants you to know that the STRIX is a part of their higher end products, I expected better. The back features the GFX card’s features, along with the specifications and the placement of their display ports graphically. Nothing extravagant. The GTX 780 STRIX also came with your usual DirectCU II paraphernalia: That includes the never aging ASUS speed setup manual, a Driver Disc, a flexible SLI bridge, 2×6-pin to 8-pin power adapter, and a DVI to VGA display adapter. I expected a more STRIX-like touch but oh well, these will do. The STRIX family of gaming gears devired their design philosophies from an owl, so there is no mistaking that the ASUS GTX 780 STRIX OC received the same treatment. Out of the box, and into the hands, we immediately noticed the STRIX graphics card’s sheer weight at almost a Kilogram. It is also very well made, and has small details that any system builders will easily appreciate. The ASUS GTX 780 STRIX OC features Two fans, each armed with 11 unique looking wide blades. Underneath it is a dense pack of heat-fins, transferring heat from the VRAM & GPU core via direct contact copper pipes. The GTX 780 STRIX OC also features ASUS’ DirectCU II backplate to keep the things at the back cool via passive cooling. This card is by no means a reference designed one, as it is almost an inch wider than the reference editions. Power is provided by an 8+6 pin PEG connector. The locking mechanism is at the top side of the card so it wont be hard for you to install or remove the connectors which is nice. The card is theorhetically, able to output a maximum of 300W of power if the PCI-E, 6-pin, and 8-pin are combined. The card features a dual DVI Output via aDVI-I, and a DVI-D port. HDMI is also supported, along with a single Display Port. Graphics cards are no strangers in our labs, but providing a precise result usually needs a lot of time and effort on our end. Helping us to do those things is an updated copy of Windows 7 Ultimate x64 SP1 and wide selection of the popular games that most probably, will sate your appetite. The BIOS/UEFI, Chipset, and Video Card drivers of the test system will be updated too, as much as possible. For refreshment purposes, let us talk for a moment about FPS or Frames Per Second. Also known as Frame Rate, FPS is the general unit of which we measure a graphics card’s capabilities. Generally, the higher value, the smoother the gameplay should be, since higher FPS means higher frames are rendered each second. Higher FPS doesn’t just improve your gaming experience, as it also helps you to react faster especially in First Person Shooter & Racing Games. Please do note that Resolution and in-game settings has a huge effect too in any system’s frame rate. Better yet, check out the difference of 30 and 60 FPS here: LINK. BELOW 30 FPS: Abysmal gaming experience. You either need to tone down in-game settings to achieve a higher FPS count or just don’t bother gaming at all. 30 – 40 FPS: Playable, albeit some issues might arise including performance hiccups on some levels / areas of your game. Tone down graphical settings if needed. 50 – 60 FPS: Good gameplay experience. Usually the sweet spot of mid-range GFX cards. Noticeable improvements over 30 FPS. ABOVE 60 FPS: You have ascended into a being far beyond human recognition with silky smooth gameplay experience. You are now a part of the PC Master Race. 3DMARK (2013) is a multi-platform benchmarking tool from FUTUREMARK, consisting of comprehensive tests that aims to gauge your gaming hardware; be it a smartphone, a tablet, a laptop, or a desktop PC. CINEBENCH R11.5 is a real-world cross-platform test suite that evaluates the computer’s performance capabilities. CINEBENCH is based on MAXON’s award-winning animation software CINEMA 4D, which is used extensively by studios and production houses worldwide for 3D content creation. CLBenchmark is an easy to use, no frills high performance compute benchmark. It compares the strengths and weaknesses of different hardware architectures such as CPUs, GPUs and APUs using a series of tests. Resident Evil 6, is a survival horror video game developed and published by CAPCOM. It’s one of my favorite PC games, mainly because I’m a fan of the series. It also has a built-in benchmarking tool to measure your PC’s performance. It’s only DirectX 9.0 compatible at the moment, though. Tomb Raider (2013) is the fifth game, and the reboot of the Tomb Raider series. It is developed by Crystal Dynamics, and published by Square-Enix. We disabled Tress FX for this benchmark. GRiD 2 is a racing video game developed and published by Codemasters and is the sequel to the award winning Race Driver: GRiD. The game was released for Microsoft Windows, PlayStation 3 and Xbox 360 on May 2013. Company of Heroes 2 is a WWII based real-time strategy video game developed by Relic Entertainment and published by Sega for the Microsoft Windows platform. It is the sequel to the critically acclaimed 2006 game Company of Heroes. Battlefield 4 is EA and DICE’s latest first person shooter utilizing the all new Frostbite 3 game engine featuring better tessellation effects and destruction compared to its predecessor. Dota 2 is a Multiplayer Online Battle Arena (MOBA) video game developed by Valve and is the stand-alone sequel to the Warcraft III based Defense of the Ancients (DotA) mod. Overclocking the ASUS GTX 780 STRIX OC is pretty easy as 1089MHz is just a flick of a finger with this beast, along with a 1802MHz memory clock speed. That’s a full 200 MHz additional to the core clock speed, and another 600 MHz for the memory clocks. Pretty good! FurMark is a very intensive OpenGL benchmark that uses fur rendering algorithms to measure the performance of the graphics card. To record the GPU’s maximum temperatures, I will run Furmark’s Fur Rendering Burn-in Test, and let it run for 30 Minutes. As always, we try to keep the results consistent by keeping the ambient temperature checked at 27ºC. We also check to see how the GPU impacts power consumption. The system is left to idle for 30 minutes before readings are taken, and load data is taken 30 minutes while FurMark is running. Power readings are taken for the entire system from the socket. The ASUS GTX 780 STRIX OC is by far, one of the fastest single GPU GFX cards we have seen so far as far as gaming performance goes; It’s just that fast, except for the Company of Heroes where the Radeon R9 290X beat it by a hairline in the 1080p performance and a margin in the 1440p performance test. Other than that, 5 out of 6 games we have tested bows down to this card. unsurprisingly, the extra memory capacity didn’t help that much. It is evident, since the GTX 780 Ti with a higher effective memory clock speed, texture rate, SMX unit count, and more shader units is still the fastest. In addition, the overclocking performance of the card is fantastic, as we saw a maximum of 15.6% improvement over the factory overclocked settings. Mind you, we never touched anything else except for the power limit, core clock, memory clock, and fan speeds. Build quality wise, the card is outstandingly well build, although the weight is just too much for my liking. I hope that ASUS will address the weight issues of their coolers next time. Who wants a sagging video card anyway? Thermals and power consumption side, the ASUS GTX 780 STRIX OC remains well within the thermal and power envelop of the GTX 780. Can’t comment about that much, except for the 0dB feature which enables the card to run silent at the expense of a higher idling / zero load temperature. So, the main question still remains: Is the GTX 780 in STRIX form still a viable GFX card to buy? To be honest, it is not. If, we’re going to base on the suggested retail price from ASUS. Though we have yet to test the GTX 970s, I believe that it is a much viable option with a faster or even performance in conjunction with a better temperature and power figures. Only buy this card if you saw it at e-tailers, or being sold by upgrading PC Gamers below the GTX 970’s SRP which is 329.99 USD. Otherwise, hit the road for the better option. 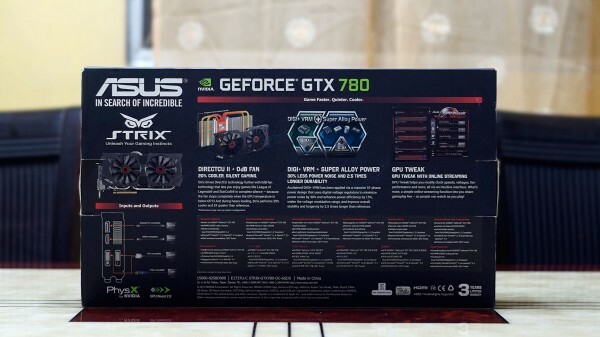 The ASUS GTX 780 STRIX OC is by far, one of the fastest single GPU GFX cards we have seen so far as far as gaming performance goes; It’s just that fast, except for the Company of Heroes where the Radeon R9 290X beat it by a hairline in the 1080p performance and a margin in the 1440p performance test.